Memory product is a commodity. Like all commodity companies, Micron goes through earnings cycles. It is in a down cycle now. Gross margin is a reliable metrics to time the trade of Micron shares. Micron Technology, Inc. (MU) is a company that manufactures and markets DRAM and Flash memory products. Its has approximately 1.1B shares outstanding, trading recently at around $42 per share for a market cap of $46.2B. It has debt outstanding of $3.6B. Cash and marketable securities amount to $7.5B, resulting in an EV of $42.3B. Micron’s manufacturing technologies are hi-tech. It uses hi-tech fabrication facilities ((fab)) to manufacture the silicon wafers on which the DRAM and Flash memory chips are produced. It uses very sophisticated testing and repair technologies to test these chips and sort out the good chips. These same manufacturing technologies are used by other silicon integrated circuit manufacturers. In order to continue to improve the cost, density and performance of its products, Micron has to continue to invest in R&D. Micron invested approximately 10.3% of sales in the latest quarter on R&D. Despite the hi-tech glamour of its business, Micron exhibits all the characteristics of a company in a commodity business. As such, one should trade Micron as if one trades a commodity company, not a hi-tech company which has pricing power through product differentiation. A commodity company and its products exhibit the following characteristics: product uniformity, fungibility, global market, a large number of buyers and sellers, and price transparency. Micron and its products exhibit all these characteristics as discussed below. Product uniformity: DRAM and Flash memory products conform to standards established by JEDEC. These standards define all required aspects of these chips, including features, functionality, ac and dc parametric values, packages and pin assignments. Conforming to these standards assures product uniformity across different manufacturers. Fungibility: Because of the standards, a circuit board that has memories in its design can use the memory products from any supplier. In other words, the standards result in fungibility as well. The use of a product from any supplier needs to go through qualification. Once qualified, a customer can freely substitute memory products from one supplier with those from another supplier. In fact, most customers buy from at least 2 suppliers to maintain price negotiation leverage. Global market: The trade in memory products happens in a global scale. Unlike other commodities such as fertilizers or iron ore, the value-to-weight ratio of memory products is high. Hence, shipping cost is not an issue at all. As a result, memory products are shipped around the world, from points of production to points of use. Air freight is usually used because of the high value-to-weight ratio. A large number of buyers and sellers: For DRAM memories, there are three suppliers that own the bulk of the market share: Samsung, SK Hynix and Micron. For Flash memories, there are six that own the bulk of the market share: Samsung, Toshiba, Western Digital (WDC), Micron, SK Hynix and Intel (INTC). However, lurking in the background are Chinese DRAM and Flash suppliers. Even though they are currently selling their products only in China, their capacity is additive to the world-wide industry capacity. The Chinese suppliers are currently behind the major suppliers in terms of technology, production prowess and capacity, but they are investing multi-billion dollars to catch up and to add capacity. History tells us that they will become competitive and will disrupt the industry. Price transparency: Benchmark prices of DRAM and Flash memories are tracked and published by services. Just like other commodities, the bulk of memory products are sold under contracts. However, these contracts are indexed to some benchmark prices and are renegotiated as the benchmarks rise and fall. Being in a commodity business, Micron has very little pricing power for its products. It is a price taker in most parts of the cycle. As a result, Micron and other memory companies have only 2 levers to maximize their profitability: maximize their output, and reduce cost (unit cost and fixed cost). As a result, no memory company will give up market share for long, as that is detrimental to their profitability and cash flow. Collectively fighting for market share by all suppliers results in the cycles. The effect of the market share and profit maximizing behavior of the industry players results in volatility of industry supply demand balance. 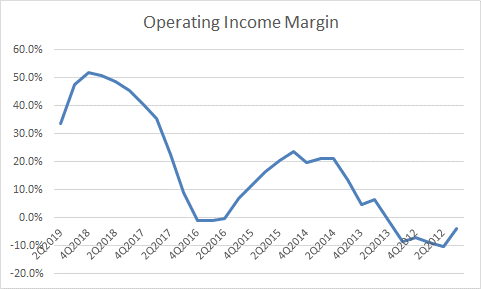 The volatility in supply demand balance leads in volatility in Micron’s historical operating income margin, which is shown in Figure 1. Figure 1: Micron’s historical operating income margin. Source: company 10-Q and 10-K. When prices of memories are low, users design in larger memory capacity for their products, creating excess demand growth. When prices are high, users reduce memory usage in their design, reducing demand growth. As Figure 1 shows, Micron has been on a tear since late 2016, growing profitability. However, profitability peaked in F4Q2018 (ended 8/30/2018). Profitability has been declining since. Micron guided lower revenue and lower gross margin for F3Q2019, it is likely that its operating margin will fall below 20% for this period. Figure 1 also shows that at the bottom of the last 2 cycles, Micron sustained losses on an operating basis. However, at the peak, Micron prints money. In 2016, at the trough of the last cycle, FCF was -$2.7B. In 2018, at the peak of this cycle, FCF was $8.5B. This type of volatility is very typical of a commodity business. Micron, despite its hi-tech facade, is a commodity business subject to market cycles. Figure 1 shows that the last two cycles for Micron lasted about 2 years from trough to peak. One can make profits trading Micron shares if one can enter around the trough of the cycle and exit around the peak of the cycle. The key is to find reliable metrics that can point to the inflection points of the cycle. Many commentaries are available from analysts about Micron and about the supply and end market demand. Most of these commentaries are helpful. Some of these commentaries focus on short term trades, rather than trading through the cycle. However, using an objective, quantitative metrics to determine inflection points in the cycle is extremely helpful to trade profitably through a cycle. Just as in any commodity business, market price of the commodity is the most reliable indicator of the cycle, subject to seasonality and other factors that are specific to that commodity. While benchmark prices of memories are tracked by industry sources, the ASP of Micron is affected by product mix and contract prices, both vary from period to period. Just as in any commodity, ASP and the rate of change of ASP are the best co-incident indicators of a commodity business. Just like any commodity business, memory prices go up (despite Moore’s Law) in a very tight supply demand balance environment. On the flip side, prices go down rapidly in an over-supplied environment. Unfortunately, the ASP information is a tightly guarded trade secret and is not available. I find that the next best indicators are the gross margin and the rate of change of gross margin. The reason is that gross margin is a financial metrics that has the closest linkage to ASP. All memory suppliers relentlessly reduce their unit cost. Hence, a reduction of gross margin indicates that suppliers have to reduce their ASP at a rate faster than their unit cost reduction rate in order to maintain market share. This is a clear indication of surplus supply in the market. On the flip side, an increase in gross margin indicates that suppliers can hold their ASP reduction at a rate lower than their unit cost reduction. This is a clear indication of a tightening supply demand balance. When market is really tight, suppliers may even be able to raise prices despite their relentless cost reduction. 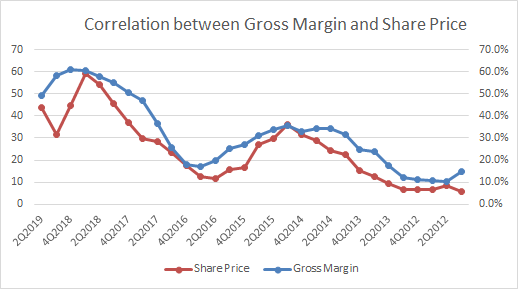 The correlation between Micron’s share price and gross margin is shown in Figure 2. Clearly one can see the direct correlation between share price and gross margin. Figure 2: Correlation between Micron’s gross margin and share price. Share price was the closing price on the day after earnings release. Source: 10-Q, 10-K and Yahoo Finance. I have found that gross margin data from Figure 2 is a very useful tool for investors who want to trade the cycle. However, it should not be used for short term swing trade. 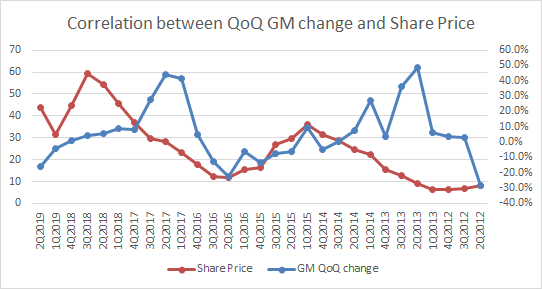 Figure 3 shows the correlation between QoQ change in gross margin and the share price. The inflection point, which is represented by the 0%-line crossing of the QoQ change in gross margin, is an excellent buy/sell signal. Figure 3: Correlation between Micron’s QoQ gross margin change and share price. Share price was the closing price on the day after earnings release. Source: 10-Q, 10-K and Yahoo Finance. I have calculated the rate of return of two hypothetical trades that buys/sells on the day after earnings release when the QoQ change in gross margin crosses the 0% line. Assuming long-only trade, the results are spectacular and are shown in Table 1. Table 1: Results of hypothetical long trades executed when QoQ gross margin change crosses the 0% line. Prices are closing prices of the day after earnings release. Source: Author’s analysis based on data shown in Figure 3. More traditional trading indicators such as P/E and EV/EBITDA ratios are poor indicators at the inflection points. At or passed the peak of the cycle, P/E and EV/EBITDA ratios show that the shares are under-valued even though underlying earning power is rapidly deteriorating because of price decline. At or passed the trough, P/E and EV/EBITDA ratios show that the shares are extremely expensive as E and EBITDA are small or may even be negative in value. Despite the hi-tech production involved in manufacturing memory products, they have all the characteristics of a commodity. Micron’s earnings are very volatile through the cycle. Investors serve themselves well to recognize this industry dynamics and trade Micron as a commodity company. The use of gross margin and QoQ gross margin change as metrics to determine trade in Micron share is shown to be highly profitable over the cycle. Note: My DNA is one of a long-term, long only investor. I currently keep a tiny short position in Micron to keep a tiny “skin in the game” during the down cycle to maintain my interest in Micron. Disclosure: I am/we are short MU. I wrote this article myself, and it expresses my own opinions. I am not receiving compensation for it (other than from Seeking Alpha). I have no business relationship with any company whose stock is mentioned in this article. Additional disclosure: All investments have many risks and can lose principal in the short and long term. The information provided is for information purposes only and can be wrong. By reading this you agree, understand and accept that you take upon yourself all responsibility for all of your investment decisions and to do your own work and hold the author harmless.